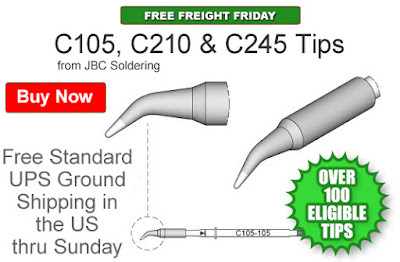 Save shipping costs on select JBC Soldering Tips (C105, C210 & C245 Series). Get Free standard UPS Ground shipping in the US when you add an eligible tip to your shopping cart. Our Free Freight Friday (FFF) promo is valid from today, January 13, 2017 through Sunday, January 15, 2017. These tips are compatible with various JBC soldering devices. Galvanic treatment tips offer outstanding thermal performance and long duration. See the individual tip product page for more info. Click here to shop or, for further questions, call us (800-966-6020), or send us an email. Please note: This promo is valid only at QSource.com and expires on January 15, 2017.